Have you ever wanted to dive deep into key-high level issues influencing policy and strategic thinking while learning about the foundations of national security? The Strategic Studies Fellows Program (SSFP) allows you to do that. For four weeks, O-3 to O-4 Officers, Chief Warrant Officers, Senior Non-Commissioned Officers, and National security professionals learn strategies to navigate the complex geopolitical environment in this 2 graduate-credit hour course at the nation’s oldest public university, the University of North Carolina at Chapel Hill (UNC-Chapel Hill). 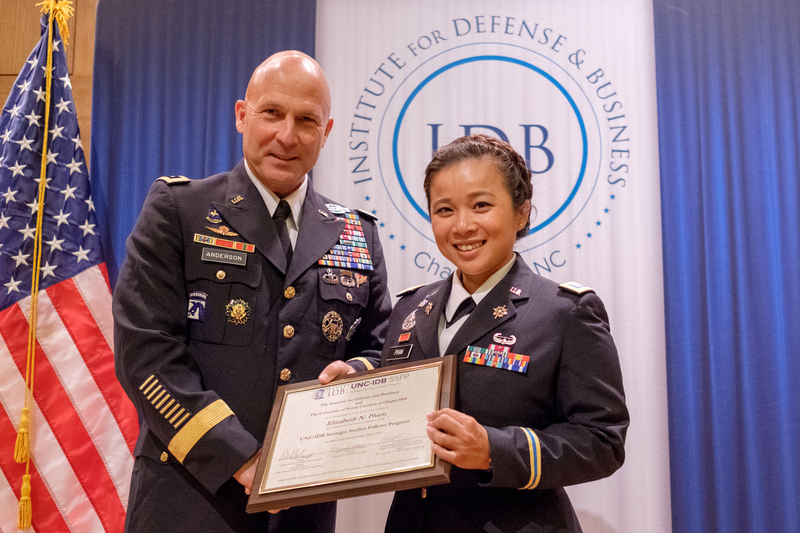 As the senior leaders of tomorrow, the Fellows will need a firm grasp on the past, present, and future of important issues impacting the defense sector. Future leaders must understand the impetus behind the decisions of the past and what leaders now are considering for issues of the future. The national security courses will put these considerations and issues into context as well as oblige the students to think strategically and critically about these issues. 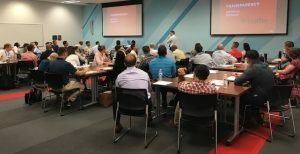 Leaders must be able to effectively communicate their thoughts, ideas, and directives not only to peers, bosses, and employees within their organization, but to those audiences external to their organization (including the media, collaborating organizations, and other unrelated, but interested, audiences). Throughout the SSFP, our faculty will provide the tools and practices necessary to communicate effectively within each of those environments. As the environment continually shifts and changes, leaders need to be able to adapt and alter their organizations to face new challenges, whether these challenges are a new type of enemy, budgetary fluctuation, or technological advance. The SSFP business faculty, drawn mostly from UNC’s Kenan-Flager Business School will challenge students to think critically, creatively, and innovatively about their organizations and management processes. 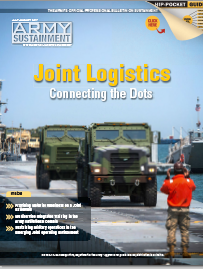 As the U.S. military and defense sector continue to expand beyond traditional roles to nation building and disaster response, an understanding of the organizations that will be working with the military and defense sector on these tasks is imperative. SSFP courses explain the roles, overlaps, and intricacies of many of these organizations. As long as the United States continues to have a global presence, it will be vital for leaders in the military and defense sector to have a current and clear comprehension of international affairs. 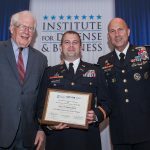 Crucially, an understanding of the global environment will allow future leaders to better predict where the next conflict, disaster, or problem state will emerge and allow them to better prepare the nation’s defense for these potential conflicts and missions. In addition to graduate-level course work, the Fellows will engage in a capstone-applied learning project with their classmates. The goal of this team project is to allow the students to collaborate and work through a difficult issue currently affecting the U.S. defense sector and will continue to affect this realm long term. The final papers and presentations will be briefed to a panel that will include several of these senior leaders. If you fit this profile and are interested in attending a future offering of the UNC-IDB Strategic Studies Fellows Program, please contact Zebrina Warner or Jaclyn Young. 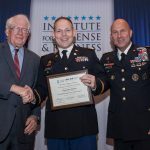 SSFP faculty members and speakers are affiliated with some of the nation’s top universities such as the University of North Carolina system and Duke University, along with the private sector, U.S. Military and Government. The two core National Security instructors, Professor David Schanzer and Professor Tim Nichols, are renowned experts in the field of National Security who built a robust curriculum when the SSFP began in 2012. The Lead Team Project Advisors, Dr. Hugh O’Neill of UNC Kenan-Flagler Business School and Dr. Navin Bapat of the UNC Department of Political Science, serve as the Fellows’ advisor and mentor as they develop their course-long Capstone team projects. O’Neill and Bapat provide critical strategic tools and lessons for the Fellows to apply to their research methods and overall project. Outside of the core faculty, the IDB utilizes its vast academic network and partnerships to identify the appropriate faculty members to complement the SSFP course themes. These faculty members are esteemed academic and professional leaders who wrote parts of the National Security Strategy, chaired innovation projects in Silicon Valley, and served as a U.S. Ambassador in the UAE. They draw upon their experiences during their sessions and present their insights to the Fellows. Tuition (Includes lodging, breakfast and lunch during weekdays with the exception of July 4th): Call IDB for pricing at 919-969-8008. 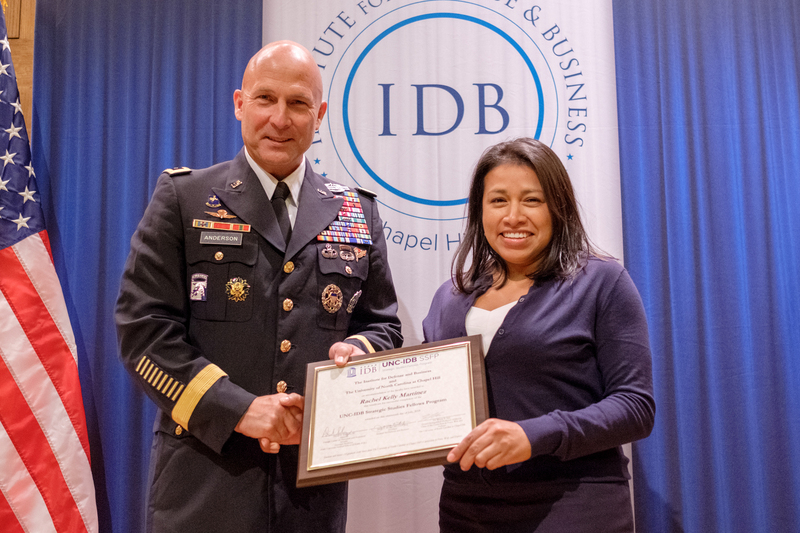 Graduates receive a joint certificate from IDB and UNC’s Peace War and Defense curriculum, along with 2.0 credit hours from UNC-Chapel Hill. Taking place on the campus of UNC-Chapel Hill, SSFP operates in a fast-paced environment, where classes and activities are held five to six days a week. Fellows take on the full embodiment of a graduate student as the IDB’s SSFPs operate in a “no rank in the classroom” atmosphere. On average, classes last for three to four hours a day, however certain classes can be up to six hours long, based on topic and speaker. Typically, there are about 25-30 Fellows in a class. 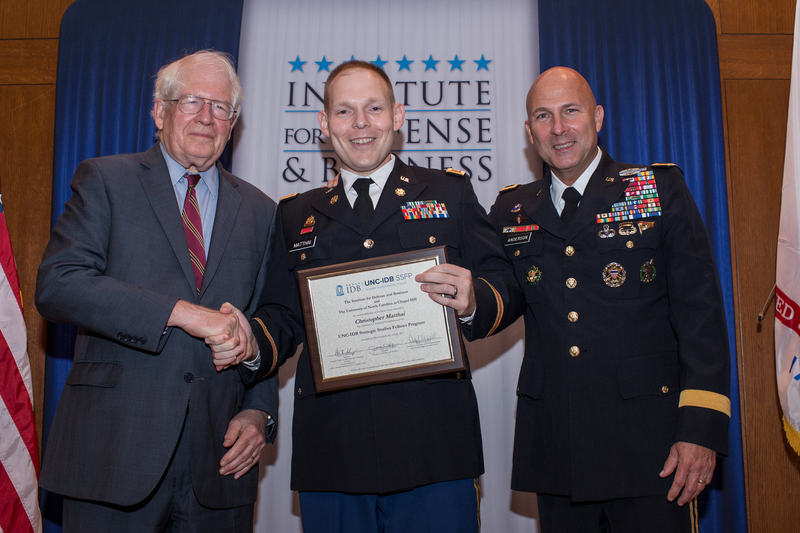 Fellows attend classes focused on national security, business, and executive skill sets. Classes allow for dialogue and debate along with occasional break outs for classroom interactive sessions. Fellows have the opportunity to challenge the thoughts of their peers, the world-renowned academics, and the experienced professionals on hot topics such as current U.S. relations with Russia to reading the U.S. Constitution and understanding its interpretation in today’s decision-making processes. Along with delving into the national security curriculum, there is a strong emphasis on building each Fellow’s executive skill set. Learning the art of influential storytelling, effective negotiating, and media relations are just a few of the executive skills that Fellows will be able to apply to their professional careers. All of our faculty and speakers utilize various learning tools and styles from lecture or a hands-on learning activity. When not in the classroom, Fellows constantly remain engaged in the program. A blog posting may be assigned for an upcoming class or a project team schedules frequent strategy meetings, sometimes over dinner or coffee. Fellows sometimes need to prepare for the next day’s class by reading an article or meeting with a professor to discuss current events. These are just a few examples of necessary outside work in order for the Fellows to apply their curriculum. 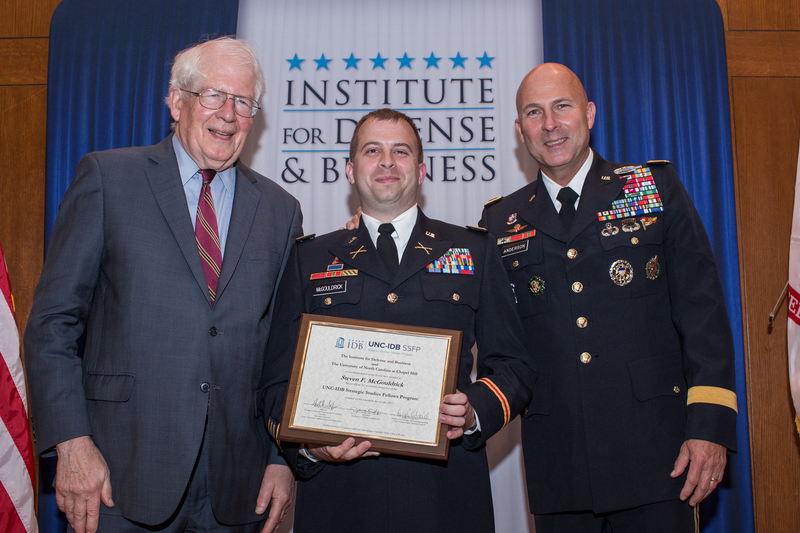 Fellows hail from all over the U.S. military and government. Whether it’s working in small groups, both inside and outside the classroom, having a discussion over dinner on Franklin Street, or attending a Durham Bulls baseball game, SSFP Fellows have countless opportunities to network and and learn from each other. The SSFP academics and speakers understand the value of this program and the impact it will have on a Fellow and his or her organization as they progress through their careers. They are always open to grabbing a cup of coffee with a student or meeting with a group to discuss their team project. Even after graduation, many Fellows stay in touch with the faculty and speakers through the IDB Alumni LinkedIn group and email. 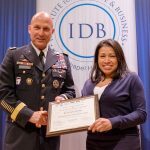 Each year, the IDB invites current senior leaders in their relative fields to speak to the Fellows on their experiences in leading their organizations, making critical decisions, and managing risks. Previous SSFP classes have had in-depth discussions with the Chief of Staff of the U.S. Army, the Vice Chief of Staff of the U.S. Army, a Fortune-500 Company’s Chief Risk Officer, UNC Basketball Coach Roy Williams, an NFL Team’s President, and many others. 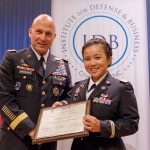 “The Strategic Broadening Seminars Prepare Leaders for the Complexities of Tomorrow” written by CPT Kwansah Ackah, UNC-SSFP Class of 2016, for Army Sustainment, July-August 2017 issue.